Envious of mates who utter fancy words while chatting or colleagues who articulate crisp and fresh sentences at the presentation meeting! Vocabulary becomes particularly important if you are appearing for exams like CAT or TOEFL, or you need to impress your bosses. Now improve your vocabulary with a mobile phone as we present you a list of vocabulary improving apps for Android phones. Choose an appropriate meaning for a word by taking ‘Word Challenges’. Every right answer will unlock additional words while the app gives you the right meaning for an erroneous reply. Click ‘Review’ to see the correct meaning, definition, pronunciation, and sentences showing its proper usage. 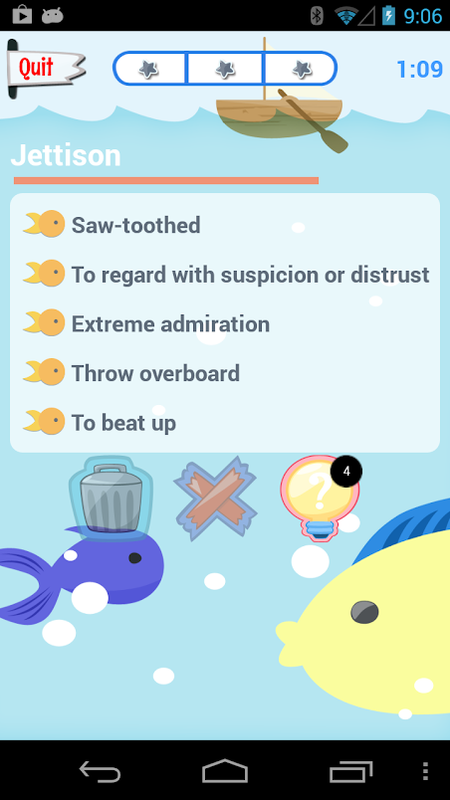 Raise the game by putting your vocabulary to test through this app. Play ‘Match the Word’ section to find the correct answer for a given word. Mind you, only one option fits so choose carefully. Besides its ‘Match the Definition’ section, you can view the endless list of words and their meanings. This app is useful when you want to review your performance for SAT or GRE. The app can be downloaded from Google Play store for free. The ‘Learn’ feature shows words with definitions. The ‘Quiz’ feature lets you match a word to its right meaning. The feature lets you track your progress and time taken to solve the quiz. By default, the app is set to Beginner level but you can change the level of difficulty. The ‘Game’ feature offers scrambled words and their definition. Check its pronunciation by tapping on the megaphone icon. 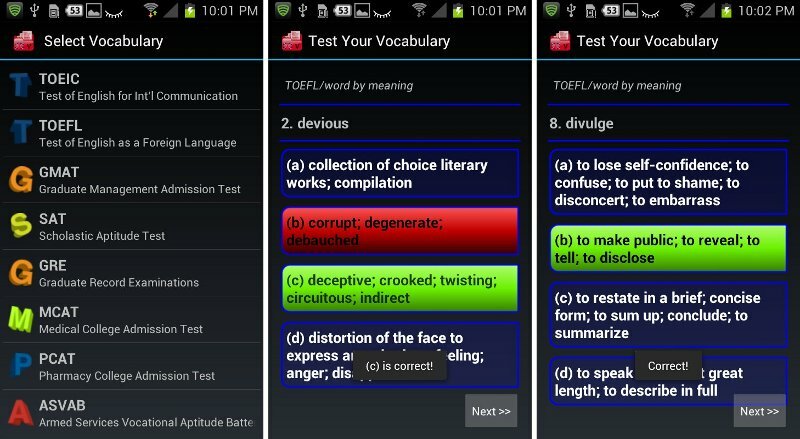 This app is essentially a useful tool for reviewing words that are appear in tests like TOEFL, GMAT, GRE, and TOEIC etc. Click on ‘Meaning By Word’ or ‘Word By Meaning’ to review the set of words. You can play games like Code Word, Anagram, Stop Word, Puzzle, and Millionaire. The app comes packed with Listening Tests. Enough of challenges and vocabulary tests! Relax; we have SAT Vocabulary for you. The app shows words in white against a black backdrop. Tap ‘Next’ if you know the meaning of the word already. Otherwise flip or tap the word to check the correct meaning. It is a very basic and simple sort of app designed for SAT aspirants. The app is devoid of distracting ads to let you enjoy vocabulary building without interruptions. Matched words with meaning/definitions and unscrambled words! Do you actually know the correct spelling for the word? No! Then download Miss Spell’s Class app from Play Store and get going. Choose the correctly spelt words from the given set of 20 words. For every incorrect spelling your score receives a ten second penalty. ‘Review’ the quiz to learn the correct spellings. You can invite your pals from Twitter or Facebook to play spelling challenges. 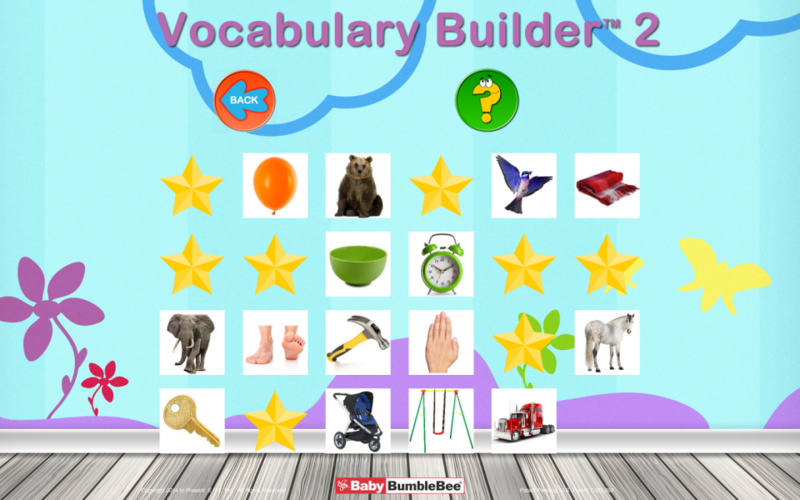 Want stress free vocabulary learning? Download English Vocabulary on your mobile phone and start learning. The app initially introduces 25 words. Click on any word to see its meaning, pronunciation guide and usage. The ‘Read More’ link at the bottom of the page will connect you tot engvocabindia.blogspot.com where you can learn more about the word. Though the app is quite useful for learning new words, it does not provide any means to review your vocabulary expansion. 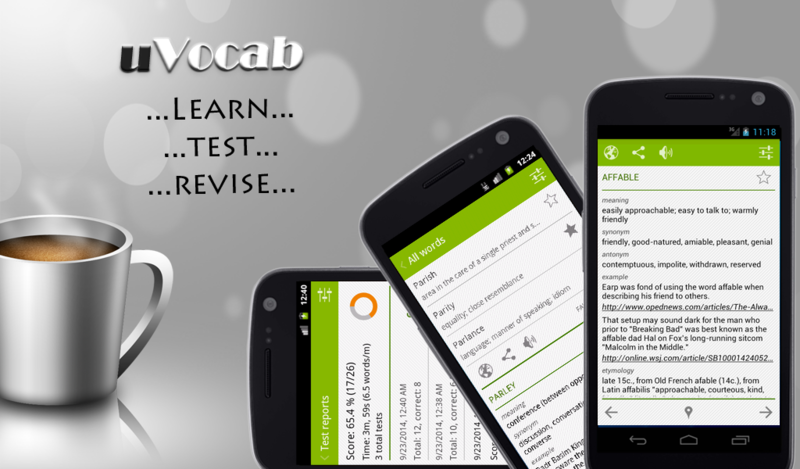 If you want to improve and build your vocabulary for an upcoming exam then this app offers an extensive stock of words that you can learn, listen to its pronunciation, search definitions online, or view its synonyms and usage. Check your growth through the ‘History’ feature.